The official excuse for the sudden tidal wave of Chinese police in the province is the June 2009 ethnic violence in Urumqi. Yet this year things seem to have gotten out of control. While small shows of dissent around the morbid anniversary are just as much a tradition now as the increased police presence has become, this year is worse. This year is a turn for the worse. Peaceful displays of contempt were replaced by a violent attack on police by knife wielding civilians. This violent spark was all it took to bring down the heel of the Chinese jackboots. With the excuse secured, the Chinese government decided to show it's muscle by bringing in combat ready police units. Security forces bristled as Ramadan approached. The dogs of war had come to Xinjiang over what could had been handled by local police forces. This over reaction by China has become typical as the communist leaders continue to push a narrative of "jihad and a "war on terror" in it's far western province. The opportunistic politicians in Beijing have utilized the "unrest" of their own making to push economic growth at the expense of local citizens. This over development of Xinjiang has allowed the Chinese to shift it's growing economy off the eastern shores and out onto the mineral rich lands of Xinjiang. It has also allowed however the racism of the ruling political class to disrupt the social structure that previously existed in Xinjiang. For decades this tinge of racism has inundated Xinjiang as government schools have pushed the idea that Han Chinese are superior to the Uyghur minorities. This is highlighted by the continued segregation of Uyghur children from Han children. Those who are placed in the same classes with Han students far too often suffer abuse at the hands of teachers and pupils alike. Yet the state does nothing to correct either the abuse or the segregation the abuse is used to justify. Then there are the state programs that offer Han benefits for moving to Xinjiang while the state simultaneously attempts to push Uyghur citizens out. Taking Uyghur females to the East to work in what amounts to forced labor has been a long running trait of the Chinese government. This practice alone could push any good intentioned individual to the point of questioning the state's motives. It not only acts as a state sponsored method of deportations but threatens the ethnic group as a whole. All of this has been done this year under the weight of a massive police buildup. A buildup that has allowed China to begin what some speculate is a "silent crackdown". 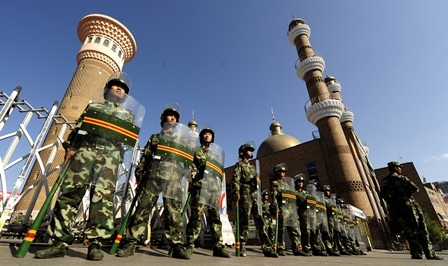 This means that China is sweeping through Uyghur neighborhoods and mosque making mass arrest. Only this time they aren't chasing the Uyghur around the city beating their victims where everyone can see. This time China is collecting their victims in night raids and door to door arrests. Since August 8th Uyghur have reported that the attendance at mosque has been down at least by three quarters what it was prior. This is in part due to unreasonable bans on prayer times and travel for Uyghur Muslims. It also is believed to be in part due to the silent crackdown that has been occurring for over around a week now. Imams have reported that Uyghur youth are not able or do not dare show up for prayers after the August 7th police violence (in which the Chinese police shot a four year old girl). Some have pointed to the conclusion that many of the youth may be among the "detained". This would mean that the Chinese are collecting the youth of the Uyghur community just as they did prior to Ramadan in areas of Xinjiang. The main reason for the mass arrest in Aykol has been the police violence that occurred on August 7th. The incident began with what China's police viewed as a "routine arrest". The state official had directed police to gather two individuals on the charges of "unlawful religious practices". When the crowd at the mosque gathered to watch the arrests the inevitable happened. The police decided to antagonize the onlookers with their usual displays of force. When the situation began to deteriorate it wasn't from lack of the officers' best efforts. The Uyghur crowd asked why the two men were not allowed to enter in and pray and simply be arrested afterward. That is when the police decided to show their force in a more profound manner... live ammunition. Civilians report that around one third of the crowd began to retaliate with rocks as the police popped off shot after shot. Another third of the crowd offered moral support as they backed off the battle lines that promptly formed. While the remaining third began to break and run. This wasn't the fire fight that China has reported. It wasn't a running battle either. This was the result of rabid police who had been encouraged to use deadly force at the drop of a hat. This was a small group of Uyghur civilians who had been pushed too far and had decided to defend themselves by any means. No, this wasn't the shoot out that the police told state media. This was savagery... state sponsored savagery. A young girl, only four years of age, paid in blood for the lack of self-control that the police showed that day. From their lack of integrity this young girl learned a lesson, for right or for wrong, that police in her country can't be trusted. That lesson, learned from the sting of a bullet, isn't one that goes way simply because the state tells you it is wrong either. That is a lesson that will forever be remembered in the scar it left behind. As for the Uyghur community in Aykol and the surrounding area, this tragic attack left at least four dead and around 50 (updated from 21) injured. It was not only a stain upon the community's Eid celebrations but was the start of a police siege of the village and surrounding area. This blood bath brought the Uyghur community only more suffering in the week that has followed it. Sweeping through the area the police collected around 300 to 400 Uyghurs. Officially the victims of this roundup are just in for questioning. However many of the family members believe that their imprisoned relatives are on their way to long term detention. This fear is accompanied by the reality that China has recently sentenced Uyghur to death for similar alleged offenses. And since China executes (at times publicly) more civilians than any other country in the world, this fear is very real to the hundreds of Uyghur the Chinese have arrested over the past week. In response to China's heightened police presence in Xinjiang province we would like to invite all those who read this to "scream" with Alder's Ledge. We understand that this tragedy is not as dramatic as those occurring in Syria, Egypt, and other war torn areas of the world. Yet it is our duty and the mission of Alder's Ledge to scream for all oppressed and suffering peoples of our sad little world. And for this reason we have decided to relentlessly cover the suffering of the Uyghur people. We want to bring a light into the dark reality that is the plight of the Uyghur community. And to do this we need you... we need your voice. Screaming is easy in this modern world. Almost too easy, yet it is essential. All you have to do is put your voice out there and tell the stories of the Uyghur who are suffering under China's oppressive system. You can do this by sharing articles like this one on your social media outlets. You can do this by starting the conversation in your own way on Twitter, Facebook, or better yet... in person. Your voice can break the silence that surrounds these tragic events. All you have to do is use it. All you have to do is scream.